Israel’s Iran Threats: Blackmail by Suicide? Netanyahu isn’t going to bomb Iran. But his crazy threats may pay off. Israel, along with its American partisans, is trying to get what it wants by threatening to commit suicide. Israel, nearly everyone agrees, would have to crazy to attack Iran. And Israel, nearly everyone also agrees, isn’t crazy. There’s a kind of Catch-22 involved here, which is why the chance that Israel will bomb Iran’s nuclear facilities is as close to absolute zero as things can get in politics. 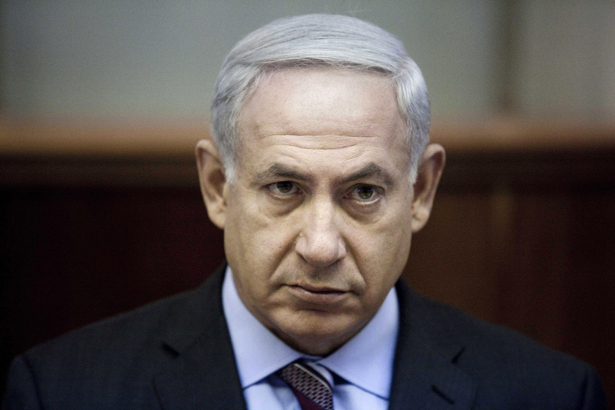 The Catch-22: only a crazy prime minister would order Israel to bomb Iran, and Netanyahu isn’t crazy. So Netanyahu must have something else in mind. After all, bombing Iran would be a catastrophe for Israel. Yet the Israelis are demanding that the world kowtow to the wishes of Prime Minister Benjamin Netanyahu, Defense Minister Ehud Barak, and Co., or else—well, or else Israel will jump off a cliff. What kind of blackmail is that? Lately, two Israel partisans have given away the game, namely, Dennis Ross and Amos Yadlin. First, Ross, an official at the Washington Institution for Near East Policy who, until earlier this year, was Obama’s chief adviser on the Middle East. In an op-ed in the New York Times, Ross helpfully provided a to-do list for the Obama administration. To stave off an Israeli attack on Iran—“in order to give Israel’s leaders a reason to wait,” in Ross’ words—President Obama “should ask Israeli leaders if there are military capabilities we could provide them with—like additional bunker-busting bombs, tankers for refueling aircraft and targeting information—that would extend the clock for them” and make “firm commitments” to supply Israel with “weapons, munitions, spare parts, military and diplomatic backing.” Ross also warned that the United States must “signal to both Israel and Iran that we mean what we say about all options being on the table.” All this, according to Ross, “in return for Israel’s agreement to postpone any attack until next year.” Get that: just to postpone an Israeli attack until 2013, the United States has to bend over for Jersualem. Washington should provide advanced military technology and intelligence to strengthen Israel’s military capabilities and extend the window in which Israel can mortally wound Iran’s program. And: “Obama should publicly commit to the security of US allies in the gulf.” In other words, the hawkish Israeli is pressing the United States to bolster its shipment of arms to Saudi Arabia and the gulf states, step up its Persian Gulf naval deployments, and otherwise back the repressive, anachronistic, and kleptocratic kings, sheikhs, and emirs. Obama, caught up in a presidential race, might indeed do some or all of that. But the idea that Israel will attack Iran is nonsense, because it’s suicide. By attacking Iran—even in the midst of a US election campaign—Israel would risk angering and alienating Washington, its main patron, in a manner likely to forever change the US-Israeli relationship for the worse. Second, with nearly the entire Israeli national security establishment strongly opposed to striking Iran, Netanyahu and Barak would isolate themselves politically, collapse their own government, and perhaps propel a much more dovish coalition into power. Third, striking Iran would trigger devastating counterattacks from Tehran and its allies, including the well-armed Hezbollah movement in Lebanon, leading to hundreds, if not thousands, of Israel civilian casualties. Fourth, already isolated internationally, Israel would turn itself into a global pariah, a kind of rogue state blamed for the consequent skyrocketing of oil prices, economic carnage and a reverberating military conflict in and around the Persian Gulf that could roil the region for a decade or more. Perhaps most important, nearly all military analysts, in Washington and in Israel itself, believe that even an all-out Israeli attack on Iran would only not eliminate its ability to produce a nuclear weapon—as stated last week by Martin Dempsey, the chairman of the US Joint Chiefs of Staff, who said: “I think that it’s a fair characterization to say that they could delay but not destroy Iran’s nuclear capabilities.” Worse, as Israel knows, an attack would solidify the power of hawks in Iran’s government. Not to mention that Iran has no bomb, it isn’t likely to get one for a few years (even if that’s Iran’s intent), and it has no means of delivering a weapon—meaning that the dire threat that Israel says might require a unilateral strike doesn’t exist. So: worried about Israel attacking Iran? Don’t be. They won’t. And let’s not reward Netanyahu for pretending to be crazy.